In 2017 We made the decision to buy a neglected farm in the mountains of South West Virginia which we are nurturing back to life and focus on raising and selling quality, homestead dairy cows. More recent posts on the blog reflect our life in the Blue Ridge Mountains while posts prior to 2017 were written as we farmed in the Shenandoah Valley. We still own property in Staunton where we make hay and grow some crops as well as keep our beef cattle. We do not, however, still rent the family farm (the property that now belongs to Mike's mother) and that farm is under new management. This blog site has been active for a decade and I thought it important to leave our original introduction (which one can find at the bottom of this page) so as to introduce ourselves to new readers. As we move into a new phase of our life, we invite you to follow along which you can do through our blog, Facebook, or on Instagram. We can be reached by email at homesteaddairycows@gmail.com or through our Facebook Page. The Cupp Farm is located in Staunton Virginia which is in the beautiful Shenandoah Valley. From our home we have views of both the Blue Ridge and Allegheny Mountain Ranges. A variety of crops, produce, and livestock are raised in this beautiful, natural setting. The Cupp family sold their third generation, grade A dairy herd a number of years ago. 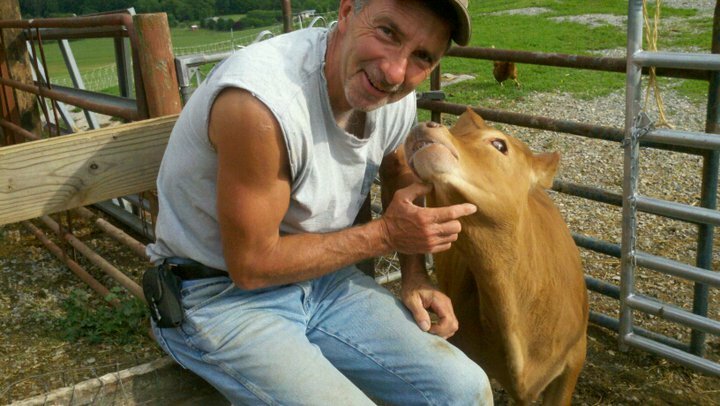 Mike now runs a brood cow operation (mostly Angus and Hereford) raising beef on the family farm where the dairy was at one time. In addition to pastured beef, Mike grows and sells quality hay both in small and large square bales, as well as round bales. During the growing season, Mike loves to work in his large garden where he produces a variety of vegetables for sale to the public. In addition to the spring and summer vegetable garden, Mike puts out about three acres of potatoes every year which he sells directly from the farm. Some of his potato and vegetable customers have been buying from him for many years and he has an established relationship with a number of families in the community who enjoy the harvest from his crops season after season. Mike is carrying on the farming tradition of his father and his grandfather who farmed this very same land. While Mike's love of farming lies mostly in growing crops and produce, Tammy's passion is with the animals. Tammy has a small herd of "family" cows that includes Miniature Jerseys registered with the American Miniature Jersey Association. Tammy uses the milk from the cows to make cheese and other dairy products for her family. Other animals on the farm include a mixed flock of free range hens (primarily Speckled Sussex ), Calico Turkeys, two Miniature Nubian goats (kept on as pets as we no longer breed or milk goats), two registered Miniature Horses, and often feeder pigs. Most of these animals enjoy a diet that includes the nourishing milk from the cow's and goats. Of course, no farm would be complete without the farm dogs. Two Miniature Dachshunds and a Pembroke Welsh Corgi make their home here on the farm as well. Although Tammy was raised for seven years on a farm as a child and worked at a dairy when she lived in Alaska as a young adult, her farming ventures did not begin in earnest until she married Mike in 2005. 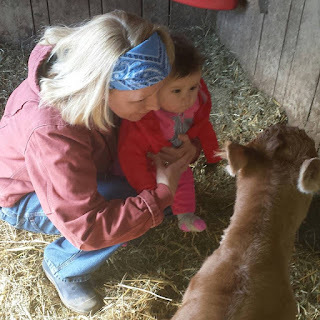 T. Cupp Miniatures is her addition to the existing, generational Cupp Family Farm. Together, Mike and Tammy have a partnership that includes love for each other as well as a love of the land they farm together. Both of them bring different dreams, ideas, goals, strengths and expertise to that partnership. Together they seek to live a sustainable life, raising their animals humanely with a deep amount of gratitude to their Creator for allowing them to be the caretakers of a small portion of what He has created.